Todd's Greenhouse - Somerset County Farmers' Market Inc.
Todd's Greenhouse is an urban farmer from Winder. We sell annuals, perrenials, vegetable plants, herbs, and produce. 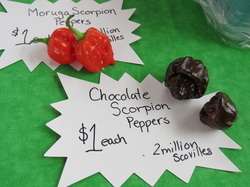 We specialize in peppers including the world's hottest peppers- Carolina Reapers, Trinidad Morgua Scorpions, and Ghosts! Our family run business began as a hobby for Todd but has grown over the past 4 years to a reliable supplier of local produce and plants.